Manchester United fans loved the way Luke Shaw stuck up for his team-mate Paul Pogba as a fight broke out during the 0-0 draw with West Ham. 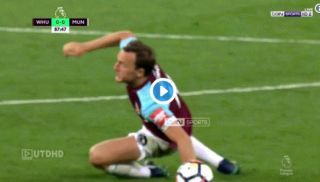 In truth, there was not much else to write home about from today’s dour goalless draw at the London Stadium before Pogba was attacked by Mark Noble in the closing stages. Somehow, the Hammers star escaped with just a yellow card after nearly clawing Pogba’s eyes out, though the pair were later seen to be best of friends again at the final whistle. There was something else United fans spotted though, as Luke Shaw briefly seemed to attempt to take on the entire West Ham team by himself to defend Pogba. We’re not sure this was too wise from the England left-back, but United fans loved it after he put in a strong performance for the Red Devils this evening. Didn’t see many others back Pogba up, other than Shaw, yet Mourinho will overlook that.